A family of double loop shaft couplings which provide stability with flexibility is now available from Reliance Precision. 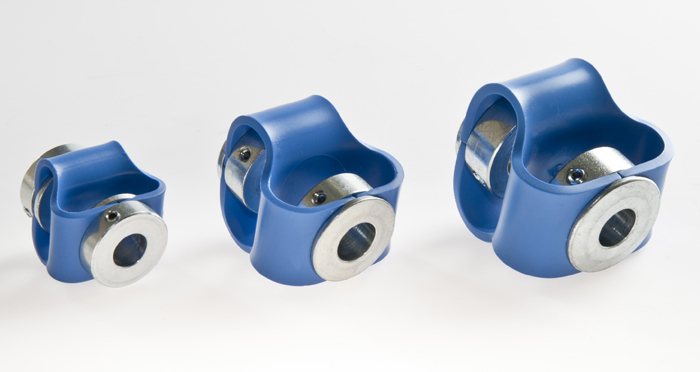 The couplings are extremely versatile due to the combination of zinc plated steel hubs and polyurethane connecting loops. This design provides torsional rigidity and good compensation of high axial, radial and angular offsets. Bore sizes range from 4mm to 19mm and keyways are available on bores at 6mm and above. The hubs come supplied with 2 grub screws conforming to DIN 916. Four overall lengths are available: 28mm, 35mm, 48mm and 60mm. The couplings minimise shock and vibration and can function in the temperature range -30°C to +80°C. Corrosion resistant, they also protect against grease, oils, acids, alkalis, solvents and hydrocarbons. These double loop shaft couplings offer design engineers cost effective and maintenance free rotary motion transfer and are suitable for a wide variety of mechanical and mechatronic assemblies.